Commissioned by the ISGM New Music Commissioning Fund for Makoto Nakura. World Premiere: American Modern Ensemble, Makoto Nakura and Robert Paterson, marimbas, Rubin Museum of Art, November 14, 2012. The idea for Mandala originated from touring the beautiful art collection at the Rubin Museum of Art in New York City. Knowing that I would be presenting a marimba album release concert with Makoto Nakura at the Rubin, we toured the collection, looking for ideas for a marimba duo we would perform together. 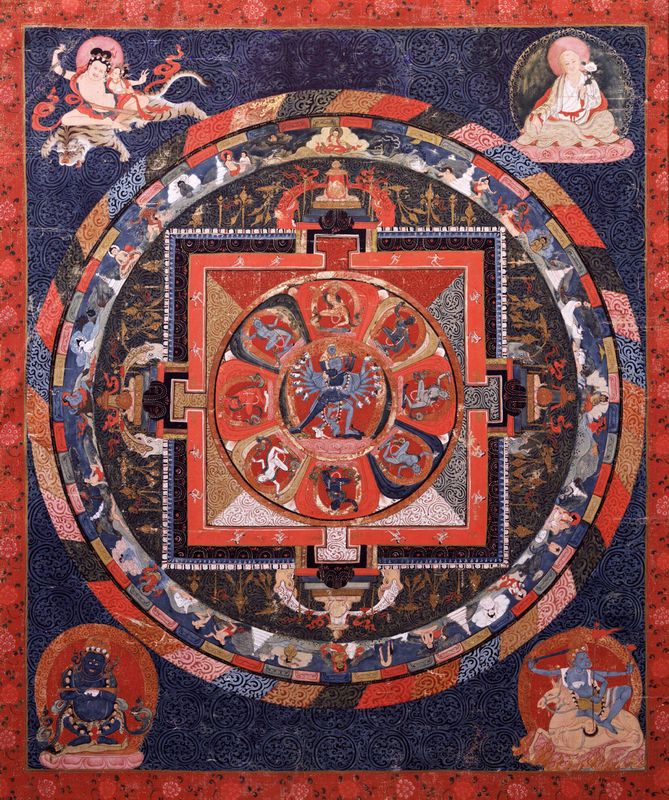 We settled on an image of a mandala, and in particular the Hevajra Mandala. Hevajra is a deity, and one of the main yidams (enlightened beings) in Tantric, or Vajrayana Buddhism, and mandala is a Sanskrit word meaning "circle." In the Buddhist and Hindu religious traditions, sacred art often takes a mandala form. In modern times, mandala has become a generic term for any chart, plan or geometric pattern that represents the cosmos, metaphysically or symbolically. Mandalas are microcosms of the universe from a human perspective. They are also often used as aids to meditation and trance induction. My musical interpretation takes this into consideration. I attempt to impart a sense of peace, happiness and oneness through the use of slow-moving harmonies and copious fifths. The primal interval of a fifth can be found in every culture worldwide. I use them as a unifying force; they not only feel good to play on the marimba, but also sound amazing. Marimbas are tuned to the octave and the fifth, so when you play fifths, you are literally hitting the sweet spot. Although Mandala may be performed once through, listeners can loop it if it is professionally recorded, thus creating a musical form that is potentially infinite. Mandala can also be looped continuously as part of an art installation. It is interesting that various aspects of the marimba are mandala-like: the circular shape of the resonators, the meditative, earthy quality of the sound of the wooden marimba bars, and even the oneness you feel as a performer while playing the instrument. The sound of a marimba envelops you as you play it, a sensation that is most easily grasped while standing right over it. Mandala was commissioned by the ISGM New Music Commissioning Fund for Makoto Nakura.